As Easter approaches, so does the Easter Bunny, egg hunts and plenty of chocolate and jelly beans. Tis the season for lots of candy. It is also a risky holiday for your kids' teeth. Naturally, candy is not good for them and while most parents understand this, keeping children away from it can be incredibly difficult. You cannot walk through the grocery store without seeing plenty of holiday candy and everyone from Grandma to the school will be giving them treats. This is why you need an anti-candy action plan. It may not be easy, but reducing their sugar intake will certainly help your children to stay healthier now and as they grow older. 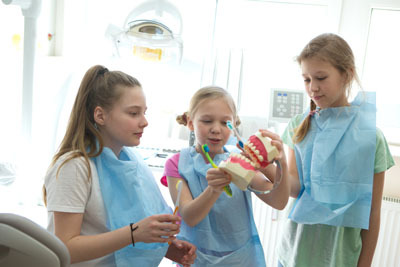 Here are our kids dentist ideas for helping you to do so. Historically, people would boil eggs and then paint or decorate them. This can be a fun activity to do with the kids as they get to select their favorite colors, add glitter, stickers, and become incredibly creative with it. Truly, this can be a fun weekend activity for you to do with them. It is important to note that the FDA finds that no one should eat a hardboiled egg that remains outside for more than two hours. Instead of hiding candy-filled eggs, hide the ones that you decorated with your kids'. They will have just as much fun finding them and their baskets will be sugar-free. Since you will not be hiding candy, make one or two of your eggs special. If your child finds them, give a prize that is not related to sweets. Perhaps you can give them a new book or a small toy that they have been wanting. As a kids dentist, we know that prizes are something kids of all ages get excited about. If you do not want your child to go completely without candy, buy the sugar-free variety. They can taste great and help to make your child feel included without actually harming their teeth or the rest of their body. If you take your child to an egg hunt in town or at church, you can always incentivize them to give up their candy. If they have been wanting something, trade them for the candy. If they want to have a sleepover or get to stay up late, trade them for the candy. It is actually fairly easy to find something that your children like more than candy. It only seems that they love it the most because of how exciting it is to find the candy in the first place. As a kids dentist in Portland, we encourage you to try some of these tips so that you can help your child to avoid eating too much sugar. This is important for the health of their teeth since candy can lead to cavities. It is also important for their health overall. Eating too much sugar can weaken their immune system and increase their risk of developing diabetes. Learning healthy habits now can set your children up for a lifetime of good health overall.